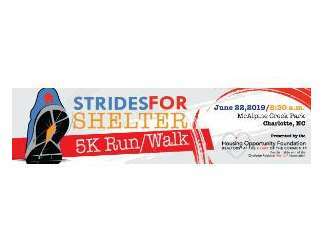 Bring your family and friends and start the summer off on the right step' with the Strides For Shelter 5K Run/Walk sponsored by the Housing Opportunity Foundation. The event will be held at McAlpine Park in Charlotte and offers a full morning of activities for the entire family. In addition to the 5K Run/Walk, participants can enjoy a Fun Run around the lake and an After-Party with food and entertainment. The Housing Opportunity Foundation is the charitable, non-pro?t arm of the Charlotte Regional Realtor® Association. The foundation strives to affect a better quality of life in the Charlotte region by promoting affordable homeownership, providing funding to create housing opportunities, and encouraging volunteerism and philanthropic activities among its 10,000+ Realtor® members. Proceeds from the 2019 Strides for Shelter 5K Run / Walk will benefit The Relatives. Seeds of The Relatives were planted 44 years ago when members of The Dilworth United Methodist Church grew concerned about young people sleeping in Freedom Park. Shortly thereafter The Relatives was created, adopting its name from youth who preferred to say they were staying "with relatives," rather than admit they were homeless or had runaway. They have grown from a small crisis shelter housing 9 youth to a vital community resource providing a full continuum of services for at-risk and homeless youth. Today, The Relatives serves more 5,000 youth, young adults, and families each year. The funds raised from Strides for Shelter will be used to purchase a much-needed van for the youth crisis center, to replace the current one which currently has over 100,000 miles and has required multiple repairs in the last year as a result of transporting close to 300 kids a year. It is used every morning and afternoon to transport the kids to their home schools, as well to medical, dental, and counseling appointments, visits to their parents in the hospital, and to other group community events.